The AKG ADR 68K is a multifaceted digital audio processor. 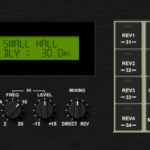 Although it produces superb reverberation, it is far more than just another digital reverb. It produces a wide range of useful time-based effects, but it is more than just a digital delay line. It can store, edit and recall samples, but it is more than a sampler. To have enough power and speed in the signal-processing chain, and in the controlling microprocessor, to support the most ambitious software needs, including: concurrent effects processing, and smooth transitions between programs. Excellent ergonomics, with a comprehensive but clear user interface. Full MIDI capability, to take advantage of the growing importance of MIDI based music and sound production. Sound quality sccond to none. A totally software based, fully-updatable system, which will allow the unit to remain technologically current over a long time. Integrated processing and control software for maximun, flexibility and upgradability. Plenty of signal memory, with room for further expansion. Plenty of EPROM memory space in the controlling microprocessor to allow for indefinite software expansion. The AKG engineers began by choosing a 68000 processor (as used in the Apple Macintosh, the Atari ST, the Commodore Amiga, and most modern CAD workstations) as a central processing unit of the AKG ADR 68K, and clocked it at 8MHz to obtain enough controlling power so that it could be counted on to fully support the signal processing and user interface needs for the long product life intended for the AKG ADR 68K. The signal processor has 256K 16-bit words of Dynamic RAM for audio memory. This allows over 8 seconds of sound sample storage, at a 16bit/15kHz performance level; moreover it is expandable to 1M words, for a potential of 32 seconds of internal sound memory. A large alpha-numeric display was designed, to keep thc user fully informed and in complete control over the units great power and variety of features. The enginecrs chose an easy-to-read four-line LCD with back-lighting, and then equipped the remote unit with convenient scrolling and paging software, allowing easy access to the many virtual pages of control information. Anticipating the explosion of interest in MIDI – not just in music performance, but in serious recording and video production – the engineers included the capability of full MIDI parameter control (not just register recall), with complete input and output mapping. This extensive MIDI control allows a degree of precision, speed, and repeatability previously unthinkable in a digital effects unit. Stereo or mono sound sources can be recorded into the ADR’s memory and edited internally. Up to 8 seconds of sound memory is available. Using the highest quality 16-bit 32-kHz PCM techniques,and this memory can be divided up into as many as four completely independent sections. A particularly ustful innovation of the AKG ADR 68K is the ability to replay samples in memory and process them in reverb or effects algorithms concurrently (simultaneously), all internally with no external mixing or looping necessary. Moreover, the internal samples can be mixed with external sound sources before being sent to the processor. For example, a sampled snare drum can be mixed with another percussive source (perhaps using the percussive source as the trigger for the sampled snare drum) and reverberated. Finally, digital mixers at the processor output can mix in a dry portion of the sampled sound as well – all before the signals leave the AKG ADR 68K. 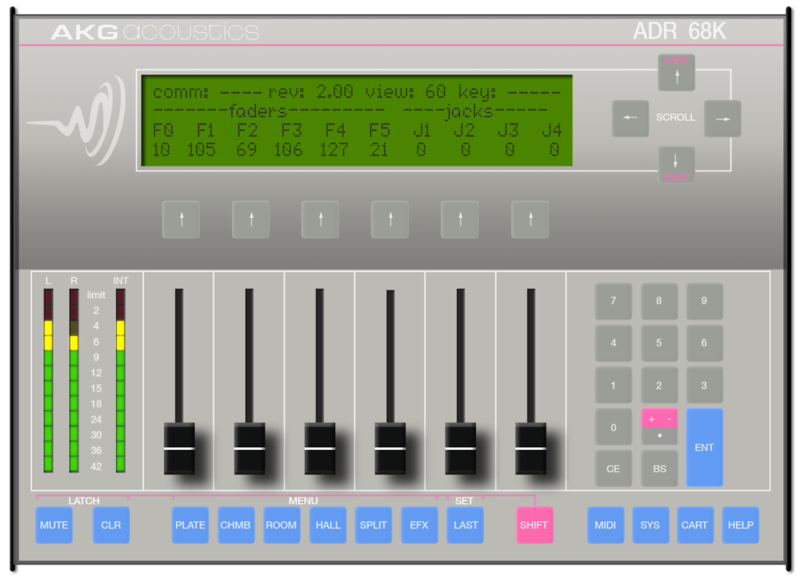 Another way to use the ADR 68K’s concurrent-program capability is to split the unit into two separate processors, such as two independent stereo reverbs, each I-in/2-out. But if bringing two stereo echo returns back to your mixer is inconvenient, the ADR 68K allows you to mix the two reverberators internally, along with the dry signals as well, into a single stereo output. Simply scroll to the Main Output Mixer page and use the mixing controls you’ll find there. As software for the AKG ADR 68K develops, there will be effects programs that will allow a number of virtual digital signal processors to be combined and adjusted concurrently. The AKG ADR 68K conforms to a high standard of audio design, using compact-disc quality 16-bit converters, coupled to quiet, high-slew rate op-amps and well-behaved sample and hold circuits. Anti-aliasing and output filters are 11th-order low-ripple hybrid low-pass, designs. No pre-emphasis has been used, thus thus ensuring full-bandwidth performance at high signal levels. A proprietary analog dither circuit is included to improve the ADC’s linearity allow levels, so that the residual noise with small signals is always Gaussian. The digital signal processor retains 32·biit internal precision for most intermediate results, and uses l6-bit storage for other internal signals. Coefficients can be specified to a full 16-bits of resolution, enabling very accurate transfer functions, high-Q filtering, and long decay times. To ensure a long product life in today’s era of rapid technological change, a product like the AKG ADR 68K must cast as little as possible of its processing power in the “concrete” of digital hardware. This means that the signal processor has to be fully controlled by microcode of substantial width, coming completely from RAM, under control of the system microprocessor. In the AKG ADR 68K, not only the microcode, but all of the critical signal processor data (coefficients, delay offsets, sampling rate, etc.) are software based and therefore freely modifiable, The result Is a general-purpose signal-processing computer with infinite room for growth. The AKG ADR 68K is truly a computing engine, a hardware bed, that will support a long future of sound-processing development.